Reminiscent of Normandy’s white chalk cliffs or picturesque fields blanketed with a downy white coating of fresh snow, the appearance of Camembert is unmistakable. Camembert’s bloomy rind is more than just a stunning landscape to be admired from afar. Eating the rind intensifies the overall flavor profile of Reny Picot Camembert and gives an added dimension in both taste and texture. What is a bloomy rind? The term “bloomy” refers to the edible mold that literally blooms on the rind of Camembert and pretty accurately resembles a fluffy patch of snow. The flavor is mild and quite pleasant and the texture of the rind enhances the experience of eating the cheese. Whether you eat the rind or not is a personal choice, but at Old Europe Cheese, we strongly advocate eating the rind. Equally as charming as the rind, the pearly interior of Reny Picot Camembert is plump, smooth, and delivers when it comes to that satisfying ooze factor. Kissed with earthy and sweet tones, Camembert charms and captivates with its slight hints of caramelized butter and sautéed mushrooms. The aftertaste is rounded and somewhat tangy, with a pleasant and soft finish. How does Camembert differ from Brie? If you love creamy, earthy French cheese with a bloomy rind, you’re probably familiar with Brie and Camembert. They both have a similar milky and sweet flavor profile, but Camembert entertains a deeper, earthier flavor and aroma. Another difference is that Brie originates from the Île-de-France while Camembert hails from Normandy. At the end of the day, Camembert is known to be slightly more intense in character than the closely related Brie. 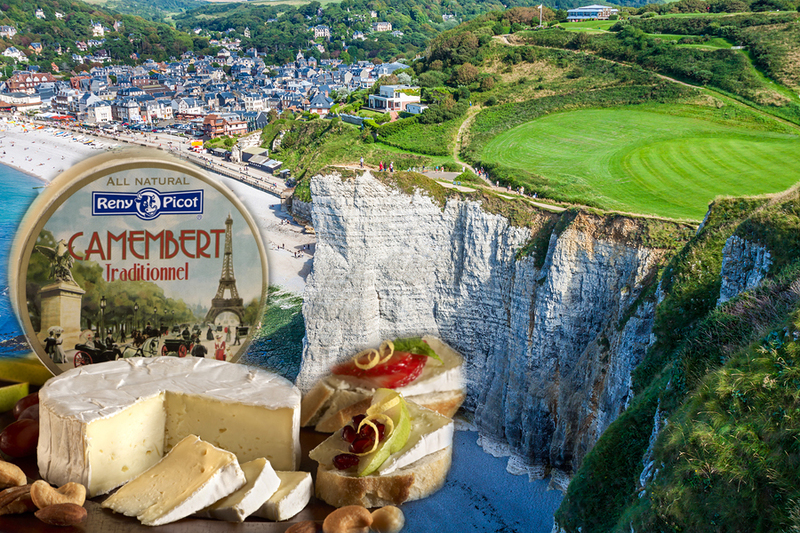 Now that you’re ready to experience the charm of Reny Picot Camembert firsthand, find it in a store near you. Also, if you have a favorite Camembert recipe, let us know! Contact us today to share a recipe or if you have any questions for us here at Old Europe Cheese. We’d love to hear from you!